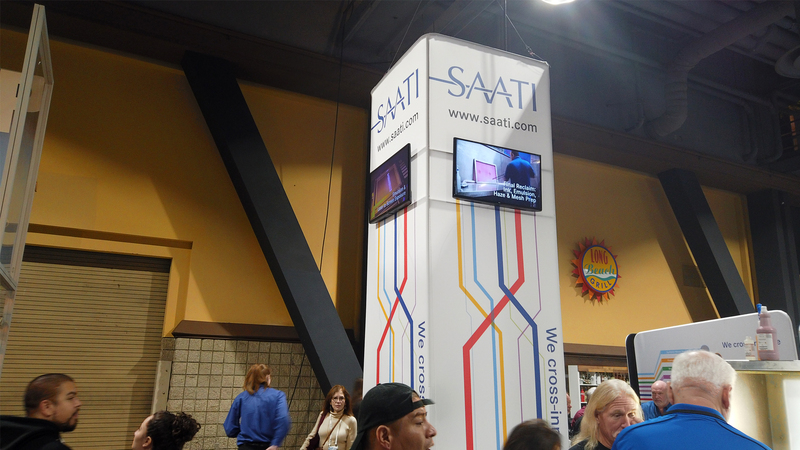 This was a very unique project that we did for SAATI. We do a lot Tower Displays, and a lot of monitor displays, this is the first time we have integrated 4 monitors in one Tower display. The height of the monitors was a challenge. We normally mount monitors at eye level. As you can see from the images and video these were mounted 12ft high. This required the addition of a cross brace to stabilize the display. Additionally the TV monitors would need to be installed while the display was on the ground, and then raised to the vertical standing position with the monitors attached. A thumb screw was added to secure the monitors to the mount to ensure the monitors would not fall off or get turned askew while raising the display. We manufacture displays in-house. The aluminum tubing is cut, swaged, welded and custom built right here in out facility in Mesa, Arizona. This enables us to do a huge variety of sizes and custom displays. As you can see from the video above this display is very portable for it's size. The entire frame fits into a single hard case (excluding the monitors) and the cloth graphics were stored in a seperate soft bag. Pretty impressive for a 5ftx5ftx16ft display! The framework is 1.25" diamter aluminum tubing and the graphics are printed on wrinkle resistant, machine washable, polyester cloth. We print to cloth using dye-sublimation, and we have the ability to print a 10ft wide roll seamless. Interested in a product like this? Email, call, or send us a quick message below. 32" tall 3D letters have a polystyrene core which is contour cut to shape using a cnc hotwire machine. Custom Children's Theming we did for Sun Valley Community Church in Tempe, Arizona.